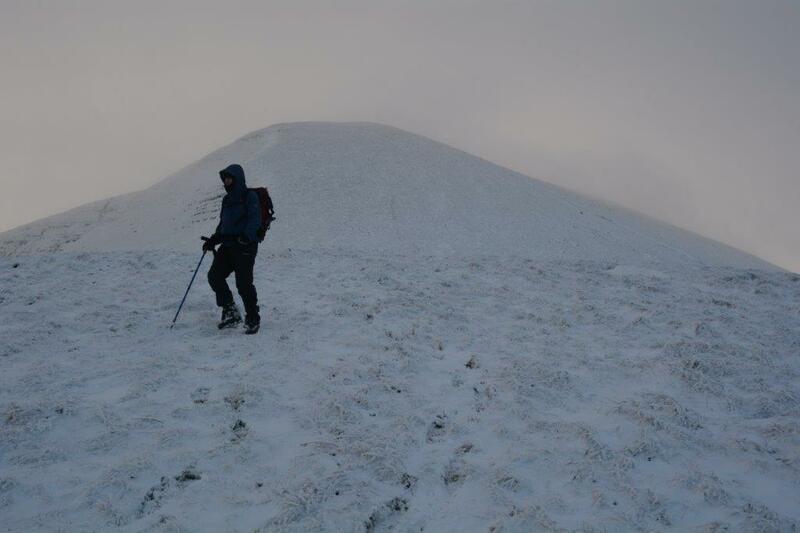 Cush Mountain: This is an excellent example of how a route can be changed on the day, to adapt to prevailing conditions and to suit the group. 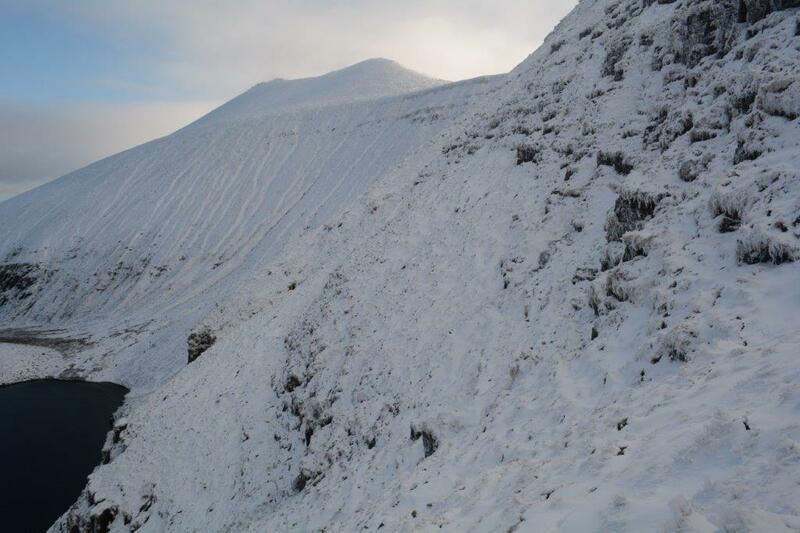 Conditions were forecast to be challenging on the northern side, so the route was changed to the Black Road. This was ideal, as there was lovely winter sunshine all day although a bit on the cold side! The snow line was quite high which made for easier walking. Five members (not counting the snowman!) climbed Cnoc Beag na nGaibhlte (799m) and had lunch just below the top. Unfortunately, there was no view of the Glen of Aherlow due to the freezing fog. The poor visibility meant a lot of bad-weather navigation practice and took a return route over Knockeenatoung (601m) which provided excellent views of the surrounding mountains in good visibility. 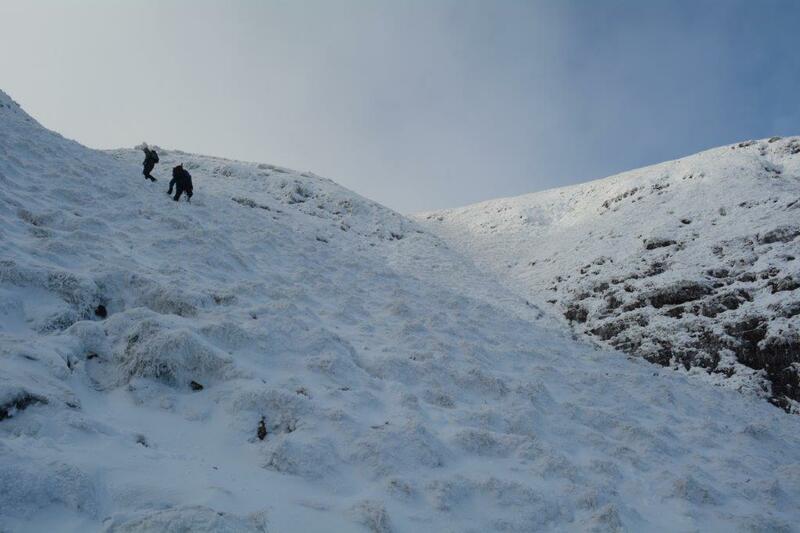 Glencush Horseshoe: Snow conditions on the Northern Galtees were so excellent that the three gentlemen on this route must have thought they were in Scotland! 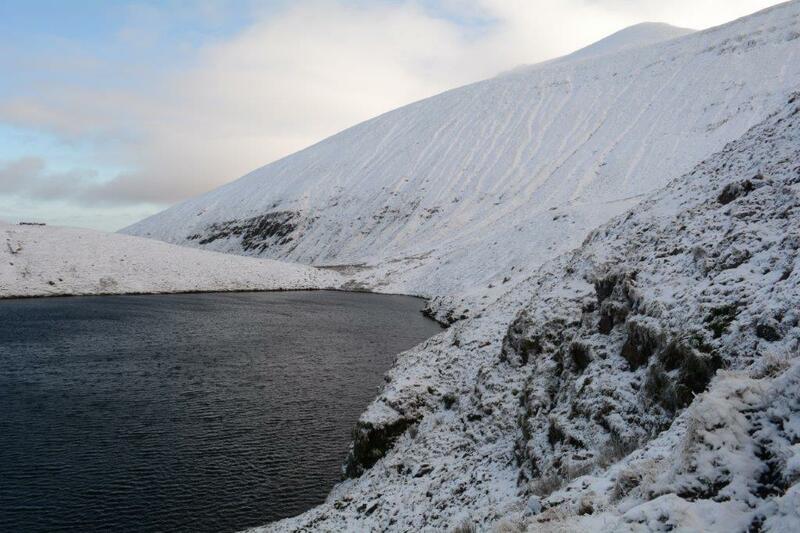 They sprinted up to Lough Curra then, after a short pause for thought, scrambled smoothly up the gully to reach the col SE of Slievecushnabinnia, the base of the climb to Dawson’s Table and Galtymore. Visibility was poor, lunch was fast and freezing and views were limited. They completed the circuit in excellent time, and arrived in time for coffee with the other group. Yes, apparently, it was just as invigorating and head-clearing as promised. Six members left the Square and made their way uphill to Fort Camden, where they admired the architectural splendour and military might of “one of the finest remaining examples of a classical coastal artillery fort in the world”. The headed off across the car park and descended to the beach where their invigorating walk was enlivened by contemplation of past and present naval prowess – Spike Island (Fort Mitchel) and Haulbowline. A very pleasant pre-Christmas walk. 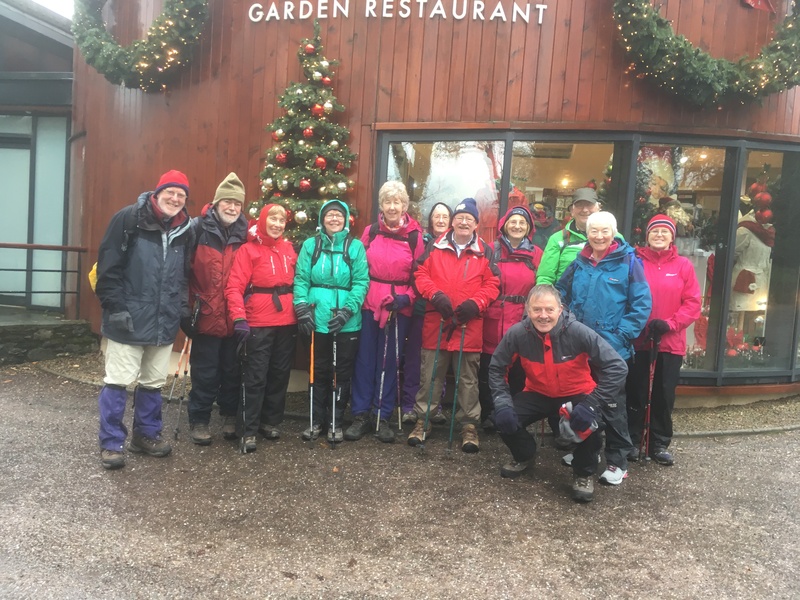 Holly Walk: 12 members indulged in coffee and scones at Muckross House before taking a leisurely walk through the parkland. They stopped to admire Torc Waterfall in full spate before climbing steeply to Torc Old Bridge, where they enjoyed their lunch. They claim to have had no rain (!) all day. They resisted the temptation to go shopping en route back to their cars, but were lured by more coffee, this time with cake. 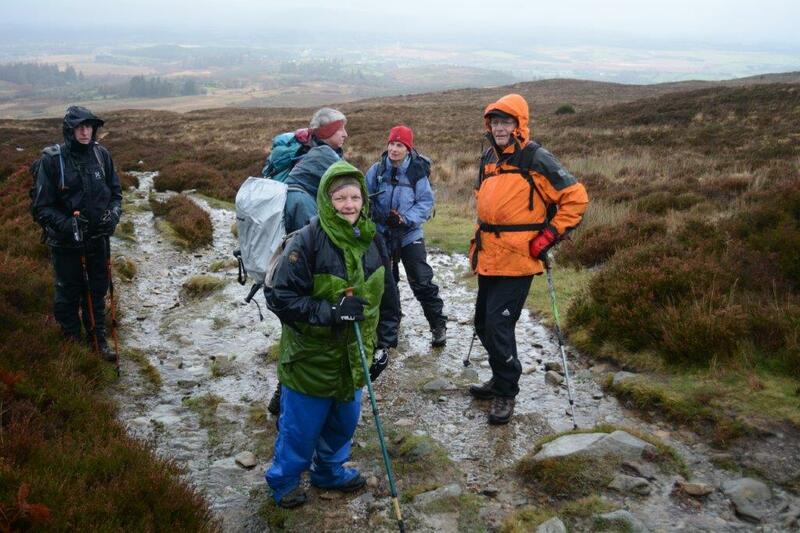 Mangerton: Seven hardy souls made a brave attempt on Mangerton in atrocious weather. The early rain developed into sleet, then snow, helped along by a bitter wind. At the Punchbowl, a group of three carried on to the summit while the rest took advantage of the shelter to have a quick hot drink and sandwich, overseen by a solitary raven, before turning for home. Our photographer refused to take photos of the epic on the grounds that his fingers were too frozen even to open his lunch box, never mind work a camera! As consolation for the freeze, he was the only one to spot two deer lurking shyly in the gorse on our return. Apart from failing to rendez-vous with one of our members at the start (! ), everything went well. 22 of us followed the way- marked way through the wood, and sat down for lunch just before we met the road. Unfortunately that was when a drizzly shower started, but luckily it didn’t come to much. We then donned our hi-viz and returned via road and track. The first part of the track had just been surfaced since the recce and wasn’t exactly comfortable to walk on. Further on we got some nice views over the countryside, and some hills we couldn’t identify as – typical! – we were on the corner of the map. Oh, and we lied; technology revealed that the promised 13 km distance was, in fact, only 11.5 kms. Strangely enough, there were no complaints about the reduction, everyone enjoyed the walk and most went for a meal afterwards. This week’s walks gave us a lesson in how planned routes are subject to change, for safety reasons, when weather conditions dictate. Conditions underfoot were horrendously greasy for both walks. Knockshane: on arrival at the Vee, it was obvious that heavy mist and clinging rain were going to stay for the day, so the original route was revised. 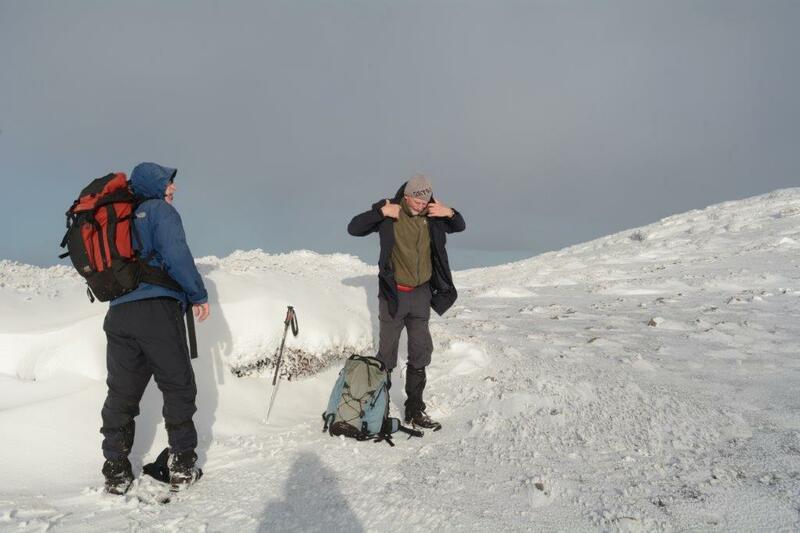 The ten members stayed in the shelter of the Glenmoylan valley as long as possible, and then climbed Knockmealdown from the col. For three of the group, it was their first time on Waterford’s highest mountain. Knockshanahullion: this walk was no different – except that the route did not have to be altered, because it was less exposed. Four motley souls signed the walk log. It was one of those days where the cloud meets the ground and stays in a handshake all day, so it was heads down and plod, with early lunch at Knockshanahullion to take advantage of the “sheltered” restaurant. Both return routes required detailed navigation, so everyone got involved. We won’t mention any diverse compass bearings in a group, or the many opportunities to go astray! The main thing was, both groups navigated their way safely down and agreed that the day had been worthwhile. No-one got hypothermia, though it was a wet “baptism of fire” for our two newcomers. The usual beautiful views may have been in short supply but the company was excellent, the conversation edifying and doing mental arithmetic in a mist is a whole new sport. 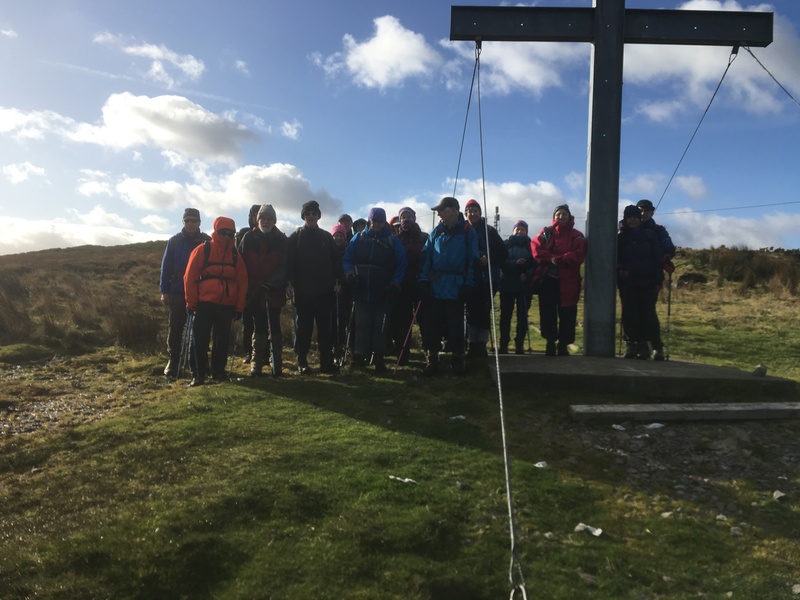 Last Sunday’s walk – “a fine loop walk” – took place in perfect November weather. In spite of a tiny chill in the air, 20 members enjoyed beautiful sunshine and (as promised) 360⁰ views from the summit of Clara Mountain. Their walk was enlivened by hearing some of the history of nearby Mount Leader House, the late Georgian seat of the Leader family, now abandoned and in ruins. 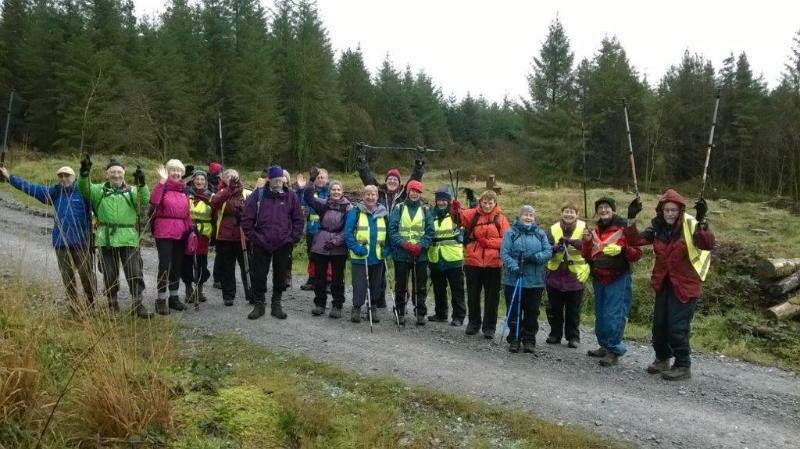 After the weather disappointments of the last two weeks, Sunday’s golden autumn weather held good and nine members had a golden Galtee day. On return to the car park they said “satisfying!”, “fulfilling!”, “ticked all the boxes!”- a lovely, long ridge route at a steady, pleasant pace. Lunchtime sunshine at O’Loughnan’s Castle, a hovering kestrel intent on its prey and oblivious of walkers, views beyond the edge of the map – what a day! Ah, the golden glory of an autumn morning as we drove west, but we soon had to accept the reality of thick cloud, persistent heavy drizzle and sodden high heather – and a north-westerly wind. With cheerful determination, eleven members plodded wetly to the summit of the East Pap, where the fog-and-rain-bound situation was reviewed. Some opted for a direct return to base; others took a variation on the planned route, paddling northwards across the bog and emerging on the green road for an easy stroll back to the cars. Yes, it was disappointing to have been obliged to cancel our Knockboy walk, but the safety of our members is paramount. We’ll reschedule it on the Spring programme, and hope for better weather. 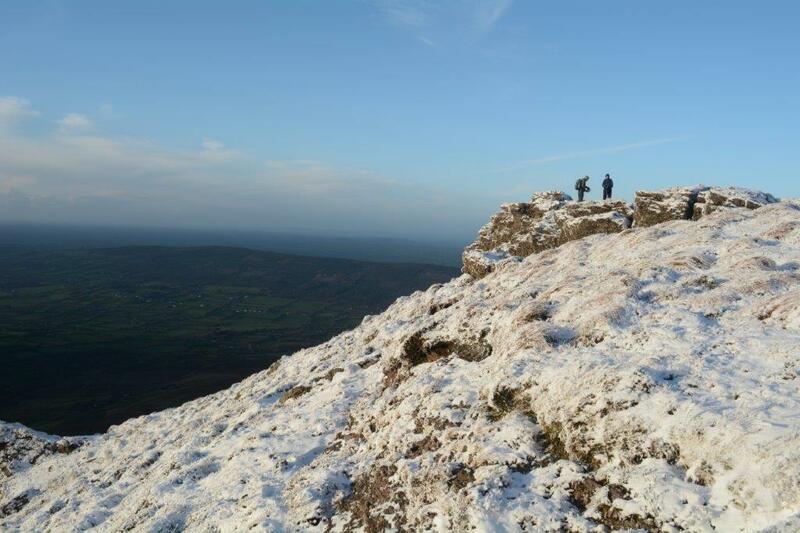 Knockboy is the highest point in Co Cork, and CMC celebrated its 10th birthday in 1985 with a bivvy (not a camp!) on its slopes. Fifteen members attended; ah, where are they now? 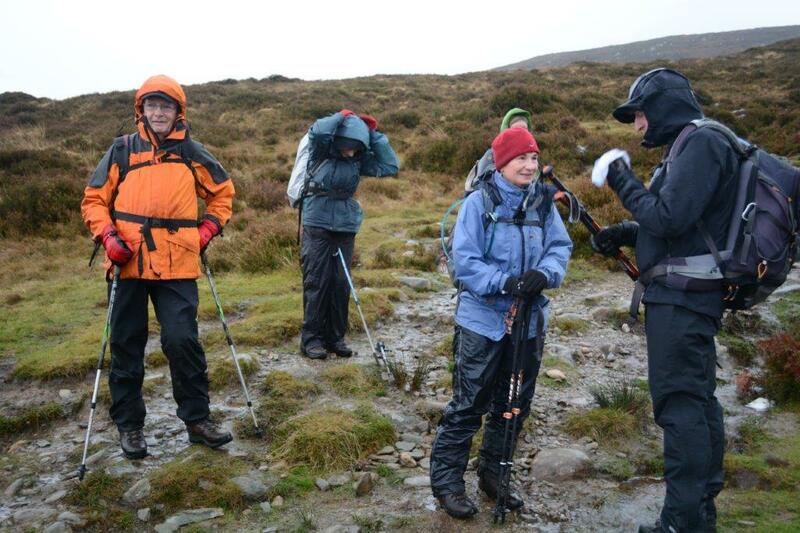 Last week’s walks in the Galtees took place in spite of inclement weather conditions. Shorter route:  the walk over Monabrack went according to plan. It was a lovely walk; five people willingly braved the elements. The weather was poor but it was a nice easy pace and pleasant company. Longer route: five members started from King’s Yard in heavy rain and low cloud. They ascended Slieve Carrignabinnia to the Galtee Wall and followed this to the base of Galtymore. At this point, they had enough sense to abandon their original plan and returned directly to King’s Yard.